The Seattle South Asian Film Festival will show films in two Seattle locations from Oct. 31 through Nov. 9. SSAF invites us to discover, experience and enjoy through some of the most radical and innovative films on gender, human rights, LGBT issues, education, and the environment coming out of Bangladesh, India, Nepal, Pakistan and Sri Lanka. Playing host to the films are the University of Washington Bothell and Cascadia College in Bothell, and the Roxy Cinema in Renton. There is an opening night gala, an opportunity to meet filmmakers, and panel discussions. Visit the tasveer SSAFF website for a full schedule. Before going, view a 30-second festival trailer. The festival’s director Rita Meher is executive director and founding member of Tasveer, a professional video editor and producer. Her current project is Threads, a feature-length documentary made on a Bangladeshi artist Surayia Rahman called Kantha. The festival’s co-director Alka Kurian is one of the founding co-editors of the journal South Asian Film and Media and the author of the book Narratives of Gendered Dissent in South Asian Cinemas. Alka Kurian spoke about this year’s festival and how it relates to her media research in this Q & A.
Q: Which one film are you most excited about featuring this year? A: Sulemani Keeda. This is a hilarious bromedy about two immigrant script writers desperate for the ultimate Bollywood blockbuster in the city of Bombay teaming with snobs, crooks, and disillusioned cynics. One of the Bombay-based central actors will answer post-film Q & A in person. The film is being screened at 5 p.m. on Saturday, Nov. 1 in Mobius Hall at Cascadia College. A still from Sulemani Keeda, directed by Amit Masurkar. Q: What is one of the filmmakers you want people to know about? A: Kanu Behl. His is the face of the emerging new Indie Indian cinema, which is not afraid to unravel the flipside of the self-congratulatory shining India. His film “Titli” encapsulates these subversions. It is being screened at 9 p.m. on Nov. 1 at Mobius Hall, Cascadia College. Behl is traveling from India to answer the Q & A with the audience. 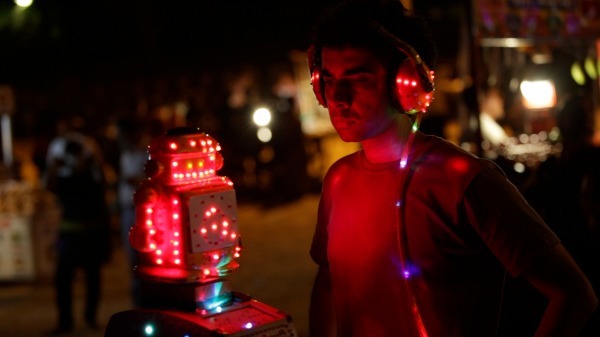 Kanu Behl’s film, Titli, is playing at SSAFF. Behl will be in attendance at the festival. Q: How does co-coordinating the festival contribute to your media research? A: It gives me a chance to directly talk to filmmakers about new cinematic themes, storytelling practices, and filmmaking techniques. To some extent, I learn about Indian cinema coming of age—as an insider and not an outsider. I also get to understand the mechanics that marginalize some of the films either for not having the right backing by a big production house or because they are seen to be too subversive. I am happy that since our film festival does not come under any commercial or political pressures, we can choose to show these films.